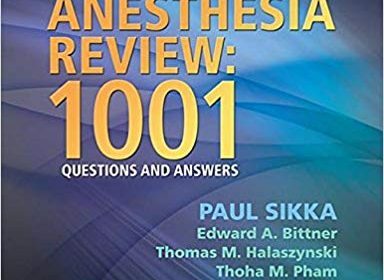 Ace your anesthesiology in-training exam, written board exam, or recertification exam with Lippincott’s Anesthesia Review: 1001 Questions and Answers! This anesthesiology exam preparation resource offers you 1,001 multiple-choice questions and answers spanning all essential topics that challenge your mastery of all the information you need to know. All 1,001 questions will also be accessible online via an interactive question bank. Review every key content area thanks to 21 chapters that cover preoperative evaluation and management • airway management • anesthesia machine • patient monitoring • fluid management and blood transfusion • anesthetic pharmacology • spinal and epidural anesthesia • peripheral nerve blocks • pain management • orthopedic anesthesia • cardiovascular anesthesia • thoracic anesthesia • neuroanesthesia • gastrointestinal, liver, and renal disease • endocrine diseases • ophthalmic, ear, nose & throat surgery • obstetric anesthesia • pediatric anesthesia • critical care • postoperative anesthesia care • and more! Practice using questions that follow the same format as the ones on the actual exams, incorporating tables, drawings, and photographs. Remedy gaps in your knowledge thanks to thorough answer explanations.